Only my second lead of my new Climbing-Knapsack Section, I had ambitions to carry on the great chapter tradition of Nevada exploration. Three other persons and myself drove up along Interstate 80 to camp at Pyramid Lake. Next morning, the Sutcliffe Cafe was a great place for ham n' eggs and coffee. From Sutcliffe, we drove over to the east, and we then headed north on NV 447. The peak makes a fine faraway sight (photo top). We passed through Gerlach, NV, and continued north on paved highway a few miles toward Cedarville, CA. We drove up a likely dirt road leading to the base of the west side of the peak. We weren't clear on access, but we knew that another dirt road from the east was on private land. We saw this other road from the top, and it would have been a short climb had we been able to drive up it. Our desire was to do some hiking, and make this peak a worthy ascent. I was doing this as a "grudge" peak, since I had failed to summit last year. Another chapter associate had climbed it in December of an earlier year. He wrote that it was up to 40 degrees for the summit temperature. We hiked cross-country from the end of the road, then straight up steep, sage covered slopes and ridges, passing some nice aspen groves. We had some 5,000 feet of gain ahead of us, but the days were now long. I used my map to guide us to a ridge. Then we saw a small drop and some contouring was necessary to gain the summit ridge proper. Coming to a small rock pinnacle near the top, we climbed and sat on it for pictures. There was a register, but another point to the southeast looked like it was worth checking. Are we glad we did! There was the official register in an old metal film can, with the names of my associates in peak climbing, so we knew we were certain of bagging the top. The view in all directions was clear, and I took several pictures. 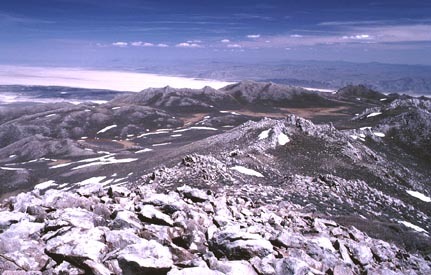 The Black Rock Desert appears to the east (left, in the photo). It was now mid-afternoon, so we decided it was time to descend. This went quickly. We stopped at some rock pinnacles about mid-way down for a rest, since we had the time. Rick, my able leader of some of my section trips in the future, was taken by the mood of things. A good climb, and lots of wild land to be seen, hit me just fine also. We were back to the car well before dusk. Heading for the hot springs just outside the town of Gerlach, I enjoyed a soak. We had a fine Mexican dinner at the Jalisco Club. The next day, we motored south to a dirt road that heads west from NV 447. Three bumps make up the summit of Tohakum Peak. I had no really detailed maps. None were available at this time. But, what map I had indicated the middle point of the ridge as Tohakum Peak. After hiking up the dirt road to a cattle trough, we climbed the open, easy dirt slopes, and came to some agglomerate caves. I looked for petroglyphs, but found none. As we continued to climb upward, a group of wild horses trotted away, about a half mile to the south on another small ridge. After one short, brushy, rocky, steep, final climb, we came to the summit of the middle bump. Old lumber and wire lay scattered about. The view of Pyramid Lake to the west and south was a bit hazy, but at the time, it was a welcome sight. We declined to go after the bump to the north that appeared higher. The others wanted to get home at a more reasonable hour. I took a picture and vowed to return some time. This peak wasn't so far from home that I couldn't make another climb. As fate would have it, I didn't have a chance to revisit this peak till 1999. I couldn't attend the local Club activity. We came back to the car by about 4 p.m. We motored slowly out. Seeing one in the road, I yelled, "Snake! Snaaaake!" This momentarily upset the others, who couldn't see that it was outside the car and crawling across the road! It was a big one. We made our drive home safely, although we were all in an old Mercury. It had its problems, by the driver, but it proved its mettle enough for this trip. After the four or five hour drive, we were all comfortably back home. The stats on these climbs totaled about 8,500 feet of gain with roughly 15 miles round trip.